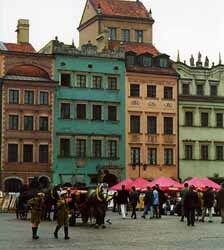 Warsaw, the capital of Poland, once had a Jewish population equivalent to the number of Jews living in all of France. It was the only city that rivaled New York’s Jewish population. The city's Jewish population was decimated during the Holocaust. Today only fragments remain. Jews settled in Warsaw during the 14th century, after the reign of King Kasimierz. Even at this early stage, non-Jewish townsman felt hostility toward the Jews. In 1483, Jewish inhabitants were expelled from Warsaw. From 1527-1768, Jews were officially banned from the city; consequently, Jewish settlers lived in jurydykas (privately owned settlements) on the outskirts of the city. Some Jews were allowed to enter the city for short periods of time. After 1572, Jews were allowed to enter Warsaw during conventions of the National Sejm (parliament). Jewish representatives in the Council of Lands were also permitted to visit Warsaw. According to a census in 1765, 2,519 Jews lived in Warsaw. This number increased after Jews were officially allowed to live in the city in 1768. By 1792, the Jewish population nearly tripled to 6,750. A Jewish bourgeoisie began to form in Poland, consisting mainly of businessman, taverners, and artisans. Jewish entrepreneurs also emerged, acting as moneylenders and army suppliers. Jews were not allowed to have an authorized Jewish community until the Prussian conquest; however, those living in the city still ran prayer meetings, charitable associations and appointed Jewish leaders to take care of tax collection and other judicial services. Following the first partition of Poland in 1772, a rise in organized street fights against the Jews took place. Three years later, there was a partial expulsion of Jews from Warsaw. Many Jews in Warsaw participated in the Polish uprising against the Russians during the partition period and were killed when Russian troops massacred the Jewish civilian population. In 1796, Warsaw became part of Prussia and Jews were subject to Juden Reglements, which only allowed Jews living in Warsaw prior to 1796 to remain in the city. By 1804, 11,630 Jews lived in Warsaw. Jews were subject to attacks by the Polish population in 1805. In the late 18th century, Hasidism spread to Warsaw. On the other hand, the Haskalah, Jewish enlightenment, was not as strong. The followers of the Enlightenment Movement (maskilim), led by Isaac Flatau, formed their own synagogue, called the German Synagogue, in 1802. 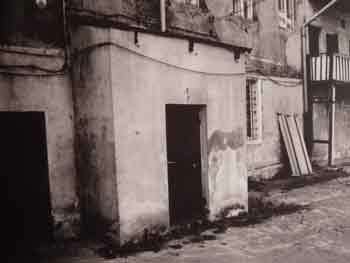 In 1809, a Jewish quarter was established in the city. Only Jewish bankers, merchants, manufacturers, army suppliers, and doctors were allowed to live there, if they agreed to wear European style clothing and send their children to general schools. In 1826, a government-sponsored Rabbinical assembly opened; it closed in 1863 during the Polish uprisings. The population of Warsaw continued to grow in the19th and 20th century. In 1816, Jews numbered 15, 600 and, by 1910, the population reached 337,000 (38% of the total population of Warsaw). This rise was due to mass migration in the 1860's and another set of migrations after the 1881 pogroms in Russia, after which 150,000 Jews moved to Warsaw. Many Jews came from Lithuania, Belorussia and the Ukraine. In the early 1800's, life in the "Jewish Quarter" was restricted, but improved in the 1860's. Jews participated in the Polish uprisings against the Russians in the 1860's. Also during this period, Jews continued to play an important role in banking. Jewish bankers also had monopolies in the sale of salt and alcoholic beverages. Jews consisted of more than half of all those involved in commerce in the city and were also involved in the crafts. During the late 1800's, Hasidism further spread throughout Warsaw. Nearly two-thirds of Warsaw’s 300 approved synagogues were Hasidic. On the other hand, the rise of the Mitnaggdim also grew with the arrival of the Litvaks. Warsaw’s Jewish leadership, until the end of the 1860's, was mainly Orthodox. Four rabbis served all of Warsaw and they removed from office all the Mitnaggdim, whom did not find favor in the eyes of the Hasidic Jews. Jewish education in this period was run by Orthodox groups in the form of the heder, small classes often located in the house of the rabbi. By the mid-19th century, nearly 90% of all Jewish children attended heder. In 1896, 433 authorized hederim existed in Warsaw, as well as a number of unauthorized ones. In this period, assimilationist philosophy became popular among the youth. Many Jews converted to Christianity and Warsaw had the highest conversion rate in Eastern Europe. From the late 18th century, the Jewish community in Praga was centered around Szeroka and Petersburska streets (now Jagiellonska and Klopotowska). A round, masonry synagogue was built in the neighborhood by architect Józef Lessel in 1836. It was one of only six circular buildings in all of Europe, and the most important meeting place for Jews in Praga before World War II.. The synagogue was used as a delousing center during the Nazi occupation. After the war, the building housed offices of the Central Jewish Committee in Poland. In 1961, the building was demolished over Jewish protest, though it was still in good condition. Since 1991, the site has been used for a public high school. The largest and most beautiful synagogue in Warsaw was the Great Synagogue in Tlomackie Square. This was the only place offering a Reform service, and it was used by the wealthy and middle class, as well as the intelligentsia. 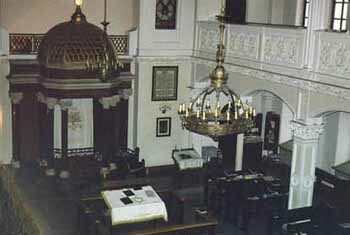 Unlike the Nozyk Synagogue where Yiddish was spoken, Polish was used in the Great Synagogue. The synagogue, designed by Leandro Marconi (who came from a family of architects, one of whom had designed the Pawiak prison later used in the Warsaw Ghetto), held 2,400 people and had a large hall, meeting rooms, an archive, a library, and a school. It was completed in 1878. The Main Judaic library was erected next to the Great Synagogue in 1936. Construction was funded by donations of the Jewish population, and State and municipal subsidies. Its designer was the architect Edward Eber. Most of Warsaw's synagogues were small, often private, prayer houses located in the courtyards or backyards of tenements. One such synagogue was discovered in one of the oldest houses in Praga-Warsaw. Built in 1811 at what is now 50/52 Targowa Street, the building was turned into a warehouse after World War II. Inside fragments of wall paintings depicting the Western Wall, Rachel's Tomb, and signs of the Zodiac remain. A Hebrew inscription says the paintings were financed by donations in 1934. Zionist groups flourished in Warsaw in the late 1800's. Chapters of Hovevei Zion and the Society Menuha ve Nahalah opened. Hovevei Zion opened its own modern heder in Warsaw in 1885. The Bund, Jewish socialists, also promoted their ideologies. The Bund was popular among Jewish workers and helped promote Yiddish culture. The Bund was ardently opposed to Zionism and the revival of Hebrew. Yiddish and Polish weeklies emerged in the 1820's and the Hebrew Press began later in the 1880's. Warsaw became the center of Hebrew publishing in Poland and many famous writers either lived or worked in the city, including: Isaac Bashevis Singer, Shalom Asch, I.L. Peretz, David Frischman and Nachum Sokolow. During World War I, thousands of refugees came to Warsaw. By 1917, there were 343,000 Jews living in Warsaw, about 41% of the total population. In this period, the Jewish population increased, while the percentage of Jews living in Warsaw, compared to non-Jews, decreased to about 30%. Many Jews — about 34% in 1931 — were unemployed. The main political struggle in Warsaw and in Poland took place between the Zionists parties and the Orthodox -Hasidic groups, which had joined together and formed the Agudat Israel. By 1936, though, the Bund had received the majority of votes to serve on the communal leadership and represent the Jewish community in the Warsaw municipality. The Polish government annulled the election results, however, and appointed a different community (kahal) board, which was used until the beginning of the German occupation. In the inter-war period, a Jewish school system existed, but most Jews attended state schools. During this period, many Hebrew writers immigrated to Israel; nevertheless, the Yiddish and Polish Jewish press still thrived. By the start of World War II, more than 1,000 Jewish workers were involved in Hebrew printing works in Warsaw. Warsaw’s pre-war Jewish population in 1939 was 393,950 Jews, approximately one-third of the city total. From October 1939 to January 1940, Germans enacted anti-Jewish measures, including forced labor, the wearing of a Jewish star and a prohibition against riding on public transportation. 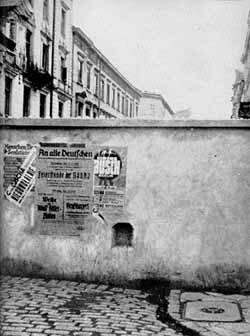 In April 1940, construction of the ghetto walls began. On Yom Kippur, October 12, 1940, the Nazis announced the building of Jewish residential quarters. Roughly 30% of the city’s population was to be confined to an area that comprised just 2.4% of city lands. Jews from Warsaw and those deported from other places throughout Western Europe were ordered to move into the ghetto, while 113,000 Christians were moved out of the area. The ghetto was divided into two sections, a small ghetto at the south end and a larger one at the north end. German and Polish police guarded its outside entrance and a Jewish militia was formed to police the inside. The population of the ghetto reached more than half a million people. Unemployment was a major problem in the ghetto. Illegal workshops were created to manufacture goods to be sold illegally on the outside and raw goods were smuggled in. Children became couriers and smugglers. Hospitals, public soup kitchens, orphanages, refugee centers and recreation facilities were formed, as well as a school system. Some schools were illegal and operated under the guise of a soup kitchen. Still, many Jews died from mass epidemics (such as typhoid) and hunger. The streets were filled with corpses. Jews in the ghetto still had to pay for burial, and if they couldn't afford it, the bodies were left unburied. Clandestine prayer groups and yeshivot were also started. Some religious Jews believed that their suffering was preordained and would bring about the Messiah. There were also many religious Jews involved in heroic acts. One famous leader was Janusz Korczak, the director of the Jewish orphanage, who chose to accompany the children he cared for when they were deported. This first mass deportation of 300,000 Jews to Treblinka began in the summer of 1942. The number of deportees averaged about 5,000-7,000 people daily, and reached a high of 13,000. At first, ghetto factory workers, Jewish police, Judenrat members, hospital workers and their families were spared, but they were also periodically subject to deportation. Only 35,000 were allowed to remain in the ghetto at one time. Adam Czerniakow, the head of the Warsaw Judenrat committed suicide on July 23, 1942, to protest the killing of Jewish children. A second wave of deportations to Treblinka began on January 18, 1943, during which many factory workers and hospital personnel were taken. Unexpected Jewish armed resistance, however, forced the Nazis to retreat from the ghetto after four days of deportations. Following the armed resistance in January 1943, all social institutions and the Judenrat ceased to function and even walking on the streets became illegal. Mordechai Anielewicz, at the age of 24, became the leader of the Jewish Fighting Organization (ZOB). He recruited more than 750 fighters, but amassed only 9 rifles, 59 pistols and a couple of grenades. A developed network of bunkers and fortifications were formed. The Jewish fighters also received support from the Polish Underground. On April 19, 1943, the Warsaw Ghetto uprising began when German troops penetrated the ghetto to begin a third round of mass deportations. The ZOB faced a formidable force of 2,000 armed German soldiers, yet the Germans were unable to defeat the Jews in open street combat. After several days, the Germans switched tactics and began burning down houses. The ZOB headquarters on 18 Mila Street fell on May 8, 1943; at this time Mordechai Anielewicz died in battle. A Polish partisan fighter from the "Piesc" Battalion of the Armia Krajowa, led by Stanislaw Jankowski "Agaton", on a rooftop overlooking the Ewangelicki cemetery in the Wola district of Warsaw (August 2, 1944). On May 16, 1943, the ghetto was liquidated and the Germans blew up the Great Synagogue on Tomlacke Street in victory. Sixty thousand Jews died in the ghetto uprising. Not all Jews were found by the Nazis by May 16 and intermittent fighting lasted until June 1943. 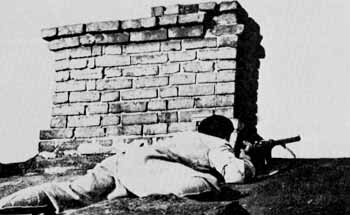 About 50 ghetto fighters were saved by the Polish "People’s Guard" and formed their own partisan group, named after Anielewicz. The Warsaw Ghetto uprising empowered Jews throughout Poland and resulted in armed resistance in other ghettos. After the ghetto was liquidated, Jewish leaders continued to work underground on the "Aryan" side by hiding Jews and issuing forged documents. Many Jews became active in the Polish underground of Greater Warsaw. In September 1944, Warsaw’s eastern suburb, Praga, was liberated and, in January 1945, the main parts of the city on the left bank were liberated by the Soviets. About 6,000 Jews participated in the battle for the liberation of Warsaw. Two thousand Jewish survivors were found in underground hideouts, when the city was liberated. When the city stadium was built, the bones of approximately 100,000 people were found in a mass grave and reburied in the city cemetery. 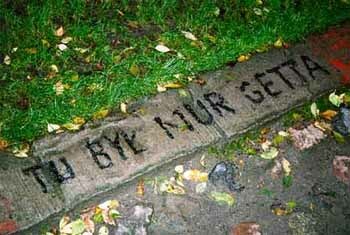 The message reads: "Here was the walls of the Ghetto"
By the end of 1945, 5,000 Jews settled in Warsaw. The population doubled when Jews who survived the war in Russia returned to Warsaw. The city became the seat of the Central Committee of Polish Jews and a number of Jewish cultural institutions were opened in 1949. Over the next two decades, waves of immigration were stimulated by anti-Semitism and communist persecution. The first large group left for Israel in 1946-47 following the Kielce pogrom. Others left in 1957-58 and 1967-68. By 1968, most Jewish institutions ceased to function. Currently, most of Poland’s Jewish population lives in Warsaw. The Union of Religious Congregations has its main office in Warsaw. There is both a Jewish primary school and a kindergarten. Warsaw also houses the offices of the Main Judaic Library and Museum of Jewish Martyrology. It is the home also of the E.R. Kaminska Jewish Theater, the only regularly functioning Yiddish theater in the world. Most of its actors today are not Jewish. While parts of Europe have seen an upsurge of anti-Semitism, this has not occurred in Poland. 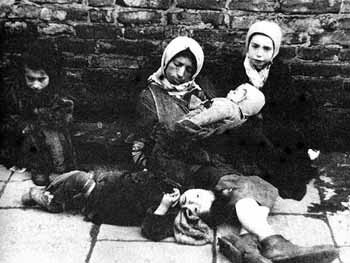 While Jews living in Warsaw feel their situation today is good, few are in prominent positions. One of the major issues for the community remains the restitution of property taken from Jews during the war. Israeli President Reuven Rivlin joined Polish officials, Holocaust survivors, and media representatives on October 28, 2014, for the opening of Poland's new "Polin Museum of the History of Polish Jews". The building was innaugurated last year and the museum cost in total over $100 million. The museum was built on the grounds where the Warsaw Ghetto stood during the Holocaust. The visit to the opening of the museum was Israeli President Rivlin's first foreign trip since his election in Summer 2014. The core exhibit tells the story of the 1,000 year history of Jews in Poland through 8 chronological gallery sections. Jewish life in Warsaw is recovering and becoming stronger by the year. In 2010 three Synagogues existed in Warsaw; today there are six. The Warsaw Jewish Community's first Jewish Community Center (JCC) was established in 2007. According to Chabad, for the first time since the Warsaw ghetto was liquidated during World War II – and all its residents killed or deported to death camps – one hundred Diaspora Jewish families from Israel, Europe and the U.S. will celebrate a Passover Seder there on April 19, 2019, along with Chief Rabbi of Chabad-Poland Shalom Ber Stambler and his family. The Seder will be divided into three groups and led in three different languages – Polish, Hebrew and English. Toward the end of the evening, they will merge and conclude the Seder as one. Not one house in the Warsaw Ghetto survived. Everything was rebuilt after the war, and the area is now a residential neighborhood. Several monuments to the ghetto and uprising are scattered about the area. In April 2013, the Museum of the History of Polish Jewry in Warsaw - built on hallowed ground of the Warsaw Ghetto - opened to visitors interested in learning more about the Jewish community of the city. The museum itself is housed in a structure of green glass and stone, symbolic of transparency, and the main entrance faces a plaza dominated by the Nathan Rapoport memorial, which commemorates the heroes of the Warsaw Ghetto Uprising. The museum's design was completed by Finnish architects Rainer Mahlamäki and Ilmari Lahdelma who were chosen from among 200 submissions to Poland’s first international architectural competition. The plot of land for the museum and an additional $13 million were donated by the city of Warsaw to the project. Chief Curator of the Warsaw Museum and New York University Professor Barbara Kirshenblatt-Gimblett said that the 1,000-year history of Polish Jews, 3 million of whom were killed during the Holocaust, was an “integral part” of the Poland’s history in general. “Jews are not a footnote to Polish history,” Kirshenblatt-Gimblett said. Between Karmelicka and Zamenhofa streets stands the "Ghetto Heroes Monument". Designed by sculptor Nathan Rappaport. 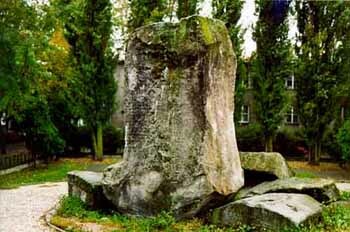 It commemorates all who lost their lives in the Ghetto Uprising led by Mordechai Anielewicz. A commemorative Gateway Monument was built on the site of the ramp, known as Umschlagplatz (collection point), used for railroad transport to Treblinka. Names of 400 Jews are etched on it. The train station began its first actions in the summer of 1942. Only a small piece remains of the ghetto walls, which were about 11 miles long. 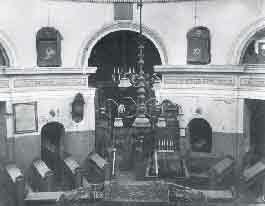 The synagogue was founded in 1902, by Zalman Nozyk, a wealthy Jewish merchant. The synagogue was known for its singing and religious music and attracts visitors from around the world. Built by an unknown acrhitect in neo-Roman style with elements of Byzantine and Mauritian ornamentation, the Nozyk is Warsaw’s only surviving synagogue from before the war. During WWII, it was was located in the ghetto. The Germans allowed public worship in autumn 1941, but it was later used as a stable. The Warsaw "geniza," a collection of holy scripts from all over Poland was under the synagogue, but it was nearly useless for some time because all the people were gone. At one point, there were more Jewish books in Poland than Jews. The synagogue was renovated and reconstructed between 1977-83. Today, services are held daily and on major Jewish holidays. In 1993, the Bank Tower was completed on the grounds where the Great Synagogue once stood. Superstitious residents believe the site to have been cursed by the last rabbi. Behind the tower is the Judaic Library building, which suffered major damage during the war, but was restored and handed over to the Jewish Historical Institute in Poland. The building presently houses offices and research rooms, and boasts a large collection of Jewish art, religious objects, and mementos. Its archives contain a large collection of materials and documents relating to Jewish history in Poland, including Dr. Emanuel Ringelblum's Underground Archives. The Institute's library has about 60,000 volumes. The Jewish Historical Institute in Poland is funded by the State and acts under the auspices of the Polish Academy of Sciences. The Institute’s library has more than 60,000 volumes of literature and old manuscripts, from as early as the 10th century. Founded in 1799, it is the oldest Jewish cemetery in Warsaw. It was almost completely destroyed in the war. In 1985, renovations took place. One can find a 26-foot sculpture to remember Jewish martyrs. Dated to the beginning of the 19th century, it is Warsaw’s largest Jewish cemetery with 250,000 people buried in 200,000 graves. Special gravestones exist for the Kohanim (priests). 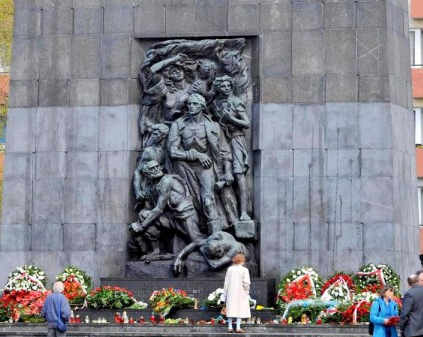 Mass graves for 300 victims of the Nazis can be found, as well as gravestones for those who perished in the Warsaw ghetto and Jewish officers and enlisted men in the Polish army who lost their lives defending Warsaw in 1939. Some of the more famous gravestones include, I.L. Peretz (writer), Meir Balaban (historian), Esther Kaminska (actress) and Dr. Zaminhoff (the creator of Esperanto). There is also a statue commemorating Janusz Korczak. Ordinarily, a Jew who commits suicide is not allowed to be buried in a cemetery, but the family of Adam Czerniakow, the head of the Warsaw Judenrat who killed himself during the war to protest the killing of Jewish children, was given special dispensation for burial in the cemetery. Sources: Beyond the Pale: The History of Jews in Russia. Ruth Ellen Gruber, Jewish Heritage Travel: A Guide to East-Central Europe, (Jason Aronson, Inc. Northvale, New Jersey, 1999). “Newly Opened Museum Aims to Show Jews Not a ‘Footnote to Polish History,’” E-Jewish Philanthropy (April 17, 2013). Paul Johnson, A History of the Jews, (Harper & Row, Publishers. New York. 1987). Poland. Encyclopedia Judaica. CD-ROM Edition. Judaica Multimedia. 1995. Photo Credits: Holocaust photos courtesy of Andrew Kobos' Shoah - The Holocaust site. Cemetery photo courtesy of Pawel Brunon Dorman. Warsaw underground fighter photo from Wikimedia Commons. Peretz grave photo courtesy of Stephen Epstein/Big Dipper Communications. Warsaw tower, old city, memorials, ghetto wall photos courtesy of Scrap Book Pages.